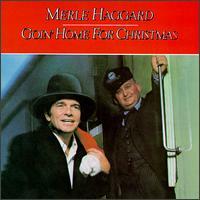 Merle Haggard’s 1982 album Goin’ Home for Christmas is largely comprised of re-recorded versions of songs that first appeared on his ’73 outing A Christmas Present, and while both certainly are not a necessity, owning either of these releases is a must for fans of traditional country music. As one might expect, Haggard’s view of the holiday is somewhat atypical as he recounts tales of economic hardship (If We Make It through December) as well as prison laments (Daddy Won’t Be Home Again for Christmas), placing them alongside tunes that are light-hearted (Santa Claus Is Comin’ to Town) and sentimental (Grandma’s Homemade Christmas Card). There are times when it tugs at the heartstrings and other times when it’s just good fun. All in all, it’s a tenderly charming collection that fuses country, blues, jazz, and swing as only Haggard can, and the playful rendition of White Christmas included on the recent reissue is merely the icing on the cake.